Converts your 6 round Glock 43 9mm magazine into a 7 round magazine without extension. The kit uses your existing magazine tube, lock plate, and base plate while replacing the follower and spring with MagGuts™ components. This conversions features our novel, ZeeSpring™ technology. The ZeeSpring™ is an application specific spring design for magazines formed from thin, flat material. The result is a very simple, space efficient spring that collapses to a super compact height which allows space for that extra round while maintaining necessary force. Includes ZeeSpring™ and follower. Magazine not included. All the reviews were spot on. The extension works very well! Now I have 8 rounds in my Glock 43 magazine. Using a Pierce plus 1 and your maggots in the 6 round mag. For a total of 8 rounds plus 1 in the chamber. Mags work grate, bought one for the SW Shield two yrs ago and it still locks open. Glock 43 is 16% more populated. And, it’s fun to install the parts! 0 issues. 7+1 capacity. It goes bang every time. Slide locks back every time on an empty mag. Easy to install, takes less than 1 minute if you can read directions. Great product. Works well in my glock 43. I was so pleased with the MagGuts kit for my Glock 42, that I immediately ordered some more the day I bought a G43. MagGuts are easy to install, and a wonderful addition to any daily carry. Excellent addition to the mags. Outstanding product. All 43 owners take a look. Converting a 6+1 to 7+1 is the right thing to do, and MagGuts does it very well. Great product! Works fine. Be sure to wear leather gloves when installing into Mag. Spring ends are very sharp. Good product – recommend it!! Great product. Need I say more? the video looked straight forward and the premise looked good, but it was real work to be able to get 7 rounds in the magazine, which I was able to accomplish and it has run for the most part. a jam or 2, but 7 rounds is a tight fit. Nothing like it when a product matches up to it’s billing. The MagGuts were easy to install and as promised, I could get another round in my single stack magazine. I promptly ordered another one for my other magazine. Love it! Retrofitted 3 magazines without trouble. Seem to work fine. Using 147 JHPs required some usage before they worked perfectly. Added these to 2 of my G43 mags and I love them. Extra round with no added bulk in having an extension. Very reliable, have 500 + rounds through them and no issues. I’ve spent time at the range with live hollow point ammo and at home with snap caps and have not had any FTFs or FTEs. I now use these for EDC. Great product. Spring is great shot several hundred rounds no feed problems the only complaint is with the follower, it needs to contact the slide release a little better to allow the empty mag to drop away and they cut out just a little bit too much. It works just fine in glock Mags. But in after markets they don’t fall away smoothly all the time. Great product, easy to install and performs as advertised. I’ve put about 200 rounds through my G43 with no problems. Nothing more to say. 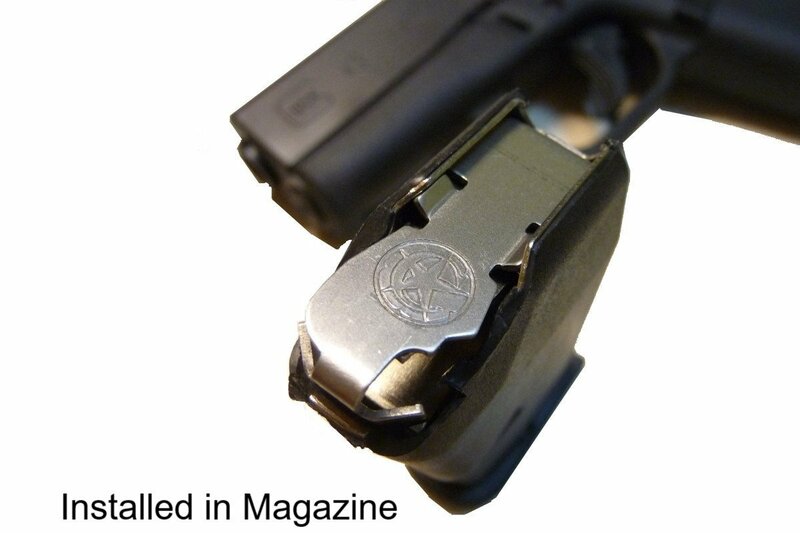 I like this item for the magazine I carry in my gun when I carry it in my ankle holster. It is the most concealable 7 round option available. It works flawlessly and was easy to install. I highly recommend it! Got this for a glock 43. Had used other mag extenders but this product allows the mag capacity to increase without extending the size of the mag. Seems to be completely reliable after about 50 rounds so far. Extended the magazine capacity by one. Works great thru 200 both hardball and HPs. Easy to install. A small word of caution to future happy owners of these springs: I had to manually cycle my G43 about 20 full magazines worth before it slicked itself up. I THEN tested it at the range and am completely satisfied. I do suggest you cycle them and keep comparing the smoothness of their feeding before you trust them with your life. That said, I will be ordering for my other G43 mag, my XDs’, etc. These Magguts kits worked flawlessly! Magguts has got a winner works flawless in my Glock 43. Great design, does exactly what the description explains. Easy install and no field issues. This product performs exactly as advertised. This was my second purchase and I will be buying more in the near future. I plan to convert all my magazines to be able to carry the extra round. The mag guts product works as advertised. It is easy to install and performs flawlessly. I would recommend this product to anyone who would like to add an additional round to the stock magazine. I got this for my brother-in-law and he likes it/it works well for his gun! Top Product. Top Customer Service!!!! Perfect alternative to add 1 without adding size. 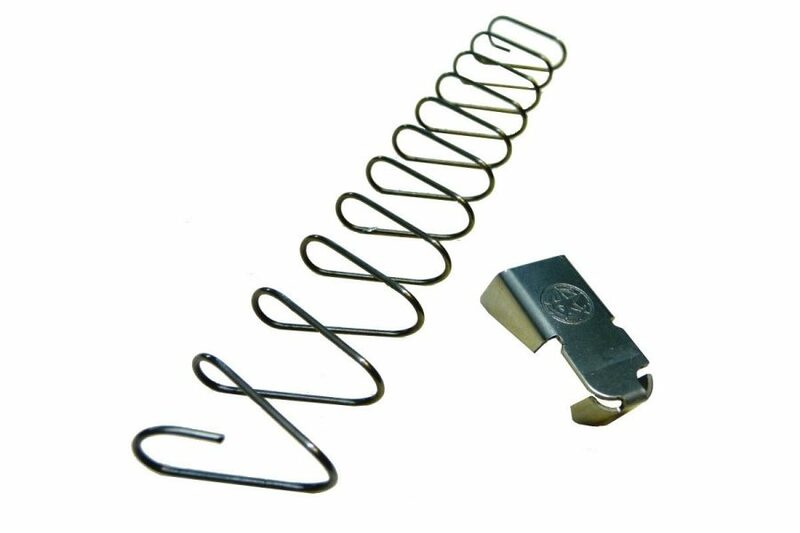 Quite impressed with something so simple as a different style spring and follower to allow one to sneak an extra round in that compact magazine. Works without a hiccup. There’s even a guy on the YouTube that has figured out a life hack for a successful pairing of this product with the taran tactical +1 baseplate that doesn’t get hung up internally and will smoothly allow 8+1 in this little carry gem. Gonna be ordering another of these kits for a spare mag I bought along with the TTi plate. Simple product, simple installation, yet the result a significant difference for a small capacity CCW. Great product! Directions easy to follow, but had some difficulty inserting and keeping the spring down to put the cap on. It kept popping up and out, thus, giving me many small metal cuts on my fingers. But I put it in a vice to hold, and finished in 1 min then. I do get an extra 9mm bullet in the magazine and use the original base to carry with. A good product. Would recommend purchase. Have test fired several different rounds and gave the magazine conversion heavy use as possible it is 100% reliable,You can stake your life on this magazine z spring and follower. Simple: haven’t received my order yet. It’s taken almost a month to get my order and still not here. So my review is bad. I’m sure magguts is a solid company. But, their shipping is horrific. Get it together. Springs that probably weigh less than 1 ounce can’t seem to navigate the country in under a month. What is this, 1963? Jeez! Replacing the OEM spring with a Magguts ‘flat’ spring was not too difficult and it gave me one additional round for my Glock43. Awesome. Both run just fine. No malfunctions. Would buy again and recommend to a friend. I have a G43 and my son has a G43 and we both got the magguts spring in them and love them. I would highly recommend them to everyone. This is the 3rd gun I have used the MagGuts components to add 1 round to the factory magazines. Like the others, it was easy to install ans works great! Great product, but a little pricey. would recommend this mag spring. The MagGuts parts appear to be well made and I like the overall concept, however I have chosen not to use the MagGuts spring unit in my G-43. I have tried several different styles and brands of magazine extensions & settled on the Pearce brand because it gives me a 7 round magazine. I was hoping that the MagGuts unit would work with the Pearce floor plate which it does not. I’m satisfied with seven rounds but I want the magazine to hold 8 rounds. When I’m at the range I unload my carry mag plus the round in the chamber and if the mag would hold 8 rounds I could put that extra round in the magazine instead of my pocket. MagGuts has a good idea and I hope they succeed. I also hope that they will make adaptations that will work with other brands of magazine extensions. Great product, excellent quality and perfect operation. A welcome addition to a proven weapon system. Works amazing and iv sent 300+rounds tho it with not one issue. Highly recommended! I installed the MagGuts spring and follower in my Glock 43 mags. Although I had my doubts about them, they work flawlessly. I have put about 300 rounds downrange through 4 mags without a single failure. It’s great to have an extra round in your primary carry gun. I liked them so much, I bought 2 for my son’s G43. Spring required a bit of break in before I could fit seven rounds in the magazine, but once broken in it works as advertised and has been 100% reliable over the course of a couple range trips and approximately 150 rounds fired. Would recommend and would definitely buy again. Works great to add an extra round to a woefully under capacity magazine.Glock could have done better.Absolutely reliable feed and slide hold open on both that I own and have tested extensively. I wanted to be able to carry this mag as a spare. At the range it worked well. However, i noticed that while loading the mag, the follower would tip up and stick out of the top of the mag. Concerned that over time it would be able to come completely out and cause a malfunction. I am unable to replicate this malfunction with either glock factory mags or maggutz kit. Great product, works great, not too hard to install, fast shipping, great price. I’m very satisfied. reliable extra 1 round perfect glock! Like all the product these functioned flawlessly. Works flawlessly with my Glock 43:copyright:. I have never had failures of any kind with them and have put over 1000 rounds through both magazines (both with maguts). I have 3 M&P springs for 9mm. two work ok and the third will not let me get the eight round in. How do i fix the problem? I got a few MagGuts for my Glock 43 after already having great success with their LCP II product. I have to say I’m equally impressed. Installation was easy and they’ve been working well. I’ve put about 100 rounds through the four G43 magazines that I modified. Not one failure to feed. I highly recommend MagGuts, they’ve been flawless for me. An extra round of capacity with no downside? It’s pretty much a no-brainer. MagGuts work! After installing a MagGuts spring, I’ve shot hundreds of rounds from my Glock G43 with no issues at all. I wanted to truly test it before giving this review. MagGuts is such a simple solution as well. No machine work necessary. Not to mention, if you sell the firearm you can easily put the factory spring back in. the spring and follower replacements work well in the G43 mags and the G42 as well. I’ve been using them for about 7 months and have run several hundred rounds through each with -0- failures of any kind. If you want to add an extra round without changing the dimensions of the magazine then this is your fix. Great spring and follower. It does what it says without a hitch. I am extremely pleased with my magguts z-spring. So happy in fact I’ll be buying a few more soon. What a well thought out product and a must have for those of you that carry a G43. Add a round to all your mags with this 5 star product!!! Zero malfunction with my first 250 rounds No FTF or FTE at all. Mic drop :microphone:! I admit I was worried using this for my EDC. For the last year, I have kept one fully loaded in my G-43 and 3 in my range bag that got fired about once a week. Have never had an issue with the 3 from the range, and today I emptied my carry ammo at the range with no failures. It’s been a year. Yes I trust them. I have used MagGuts kits in all my single stacks; M&P Shields 9, 40 S&W, and a G42. So when I recently got a G43, I quickly ordered 2 kits for it. They were simple to install, though I have not yet made it to the range to test function? I just wish a kit for the Shield 45 would be made available, although I have been told by MagGuts that it’s “in development“. Easy to install (hardest part was getting the mag base off). So far put 200 rounds without any problems. Very pleased, I would recommend. Good to have, hopefully I will never need the extra round. Still a nice addition on the range or for practicing. The price was right and they worked with a Fab Defense +4 extension even though you said they weren’t compatible with extension devices, but I’m sure you haven’t tried every one made. Needless to say I’m happier than a pig in his own excrement! LOL! I’m headed to your site to purchase a couple more right now! THANKS MAGGUTS!!! My Glock 43 magazine runs smoothly with the magguts upgrade. Simple to install. I’ve had it installed for a few weeks on my 43. I’ve put several hundred rounds of different brands of ammo. Including my defense ammo without any failures. It works as advertised. Best way to get that plus one and still keep my G43 extremely concealed with flush magazine!!! Ran it hard at the range with no failures!! My second one and I’m sure it won’t be my last!! Fast shipping and quality product!! Works great! Top notch costumer service as well. Reasonably priced, reliable function, a great addition to your Glock. Fantastic product and great company. This is one of the revolutionary products I’ve seen hit the pistol market and it works! I have one for my Ruger LC9s also with 100% reliability. I’m a smaller guy so big extensions don’t work for me, it makes me like my Glock 43 even more. So it appears to be a well made fairly well thought out product. That being said I can not trust my life to it. Fmj never gave it an issue always feed after a 1000 rounds of fmj not an issue. Now to the problem… hollow points the round that you would be carrying in a self defense situation not as reliable. Regular 115 grain basic hollow points were fine. 147 grains gave me the most issues out of every box of 50 3-5 on average would fail to feed. Followed by any hollow point regardless of grains that had a little rubber tip. Simmilar results 3 on average out of every 50 would fail to feed. This in my opinion is something I couldn’t live with in a self defense situation. Were the mag I use could fail at the time of crisis. Magguts you are on to something good here please look at these issues. Which after a quick google search seem to be fairly common. And figure out what you need to do to make it work 100% all the time. I will only use it as a range mag at this time. Hope this helps anyone else trying to make a decision. If nothing else please test one of these with the ammo you intend to use to ensure it works reliably.. don’t just stick it in there an never check you are putting yourself in a bad situation. Magguts changed the spring design in order to prevent you from using their product with another +1 so you can get +2. Don’t know why they have this attitude problem, but will never buy another one of their products because of this attitude. Easy to install and fits the extra round without difficulty. Flawless function so far. Will be getting more! Hard to put together and does not increase round capacity. I got a coiled spring which i know is not the one they made for the g43. The follower jiggles around. Obviously they’re not very organized. Dont purchase from them. You’ll get the wrong product. Love MagGuts! 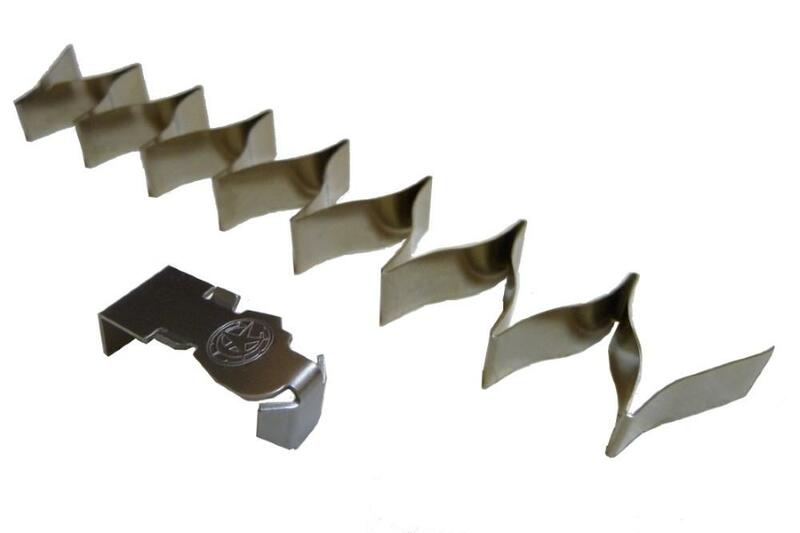 When are you guys going to make springs for extended baseplates like the extremely popular ones from Taran Tactical? +1 or +2 baseplate with +1 MagGuts? Come on guys, let’s make this happen! It’s a little hard to get that last round into the mag, but there aren’t any feed issues so far. I wish I could get one that fit into my ruger factory issued lcp2 extended mags. Bring the +1 capacity up to +2 or +3. Works great in my Glock 43 though. Have used these in Glocks, Shields, and Bodyguards and never had an issue. They work as advertised. Product seems to be high quality. I’ve been using this on my G43 mags for a couple months now and have had zero malfunctions. Product does what the description says. Installed the magguts in 3 glock 43 mags. So far put 400 rounds of tulammo, sig performance, imi hollow points and some hornaday critical defense and have had no failures. Great addition for my carry gun. Also have them in the wifes 42 no issues. Used MagGuts on my P380 and they are great. This is my first experience with the “Z” spring. It works as advertised. Bullets can nose-down easier while loading vs. the stock setup. Also it’s louder – the spring scapes against the mag walls, unlike stock. Shipment is quick and the product is top notch. I have purchased 12 of them so far perfect functionality. Installation is easy. I highly recommend. These work well as prescribed, I only wish there were a longer spring that would allow it’s use in conjunction with the +2(for +3 total) extended floor plate.. Excellent product. I would love to see a higher round count for the extended Glock 43 after market mags. This was my 2nd set of MagGuts. I had previously purchased them for a Glock 42. This product functions perfectly and performs exactly as advertised. The follower looks more professional than the stock follower. Works great, easy to install. I had one for my shield, and now have 2 for my glock43. I Will deffinatly buy more as I get more magazines. I have used these in 2 guns, Glock 42 and 43. This is a must do up grade. It works so we’ll and is so dependable I wonder why Glock doesn’t OEM these systems in all Glock single stacks. Amazing product, needs to be better publicized!!! an extra round without a longer magazine. Fantastic. Any other magazine being planned? 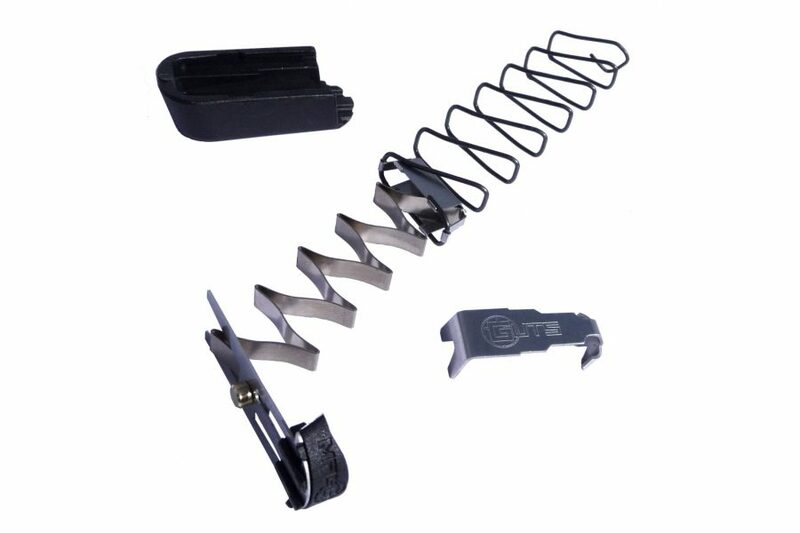 Just bought my second spring for second carry magazine, excellent product and works as expected. Nice to have extra capacity for very little cost. Well made. Works Great, make sure to look at spring orientation. Has worked for 50-100 rounds. Easy to load the factory 6 Rd mag with now a 7th round without excessive last round tension. I expect it will function reliably with thousands of rounds – though I had not been able to find a review of “thousands-of-rounds-reliability” prior to purchase. Installed these in just minutes. Instructions were very clear, and they functioned flawlessly. I purchased the magguts glock 43 extra round kit because I wanted more capacity without increasing length of grip. To me, the whole point of a gun this small is concealed carry and length of grip matters. I ran several magazines with various types of 9mm ammo. No problems so far. Only time will tell what the long term durability is. I think it will be good. I now trust this magazine for carry. I finally took my magguts magazine to the range. It ran flawlessly. I only wish Glock 43 mags came with a seven round capacity from their factory. I will carry magguts in my every day carry defensive pistol with total confidence in its reliability. Now I need to pick one up for my Ruger LCP2 also. Works perfectly in my Glock 43 as I’ve come to expect from Magguts. Worked perfectly. Now I need a couple more for another pistol. Bought 2 sets of internals for my Glock 43. They shipped fast and went in easy. Work perfectly and no hangups after approximately 250 rounds. Excellent product and company. Purchased a couple about 3 years ago for my wife’s Glock 42 and runs flawlessly. When I purchased my Glock 43 I knew I’d be making another purchase. Not my first rodeo with these in different firearms. 100% reliable so far in Glock 42 and 43, where one extra round is a big deal. Very quick delivery. Works great. Fast shipping and product works as advertised. Overall great product. 1 of the 5 I ordered has problems holding the slide open on the last round, but the other 4 have been perfect!! Good product, shipped fast, great transaction. Would prefer 8 round in 7 round package. good stuff. pretty easy to install. would recommend! Works well. Increased capacity as well as feed improvement. I suggest not using the speed loader since it causes the follower to tilt upward.